Ekklesia has been raising funds and making plans for 2 years to start a women’s shelter. And now it’s starting to happen! A partnership is forming between Ekklesia Church, Kitsap County, Georgia’s House Women’s Shelter, many churches, community leaders, and supporters. A tiny house village is forming with room for 20+ tiny house structures. What a wonderful opportunity to serve the least of God’s children here in South Kitsap County. 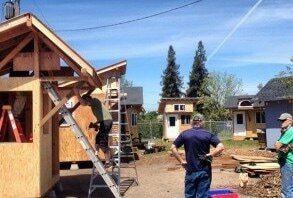 Take a look at what happened a few years ago in Eugene, OR and how the Opportunity Village developed. Their web site www.squareonevillages.org has a great video produced by PBS that explains the whole ministry.